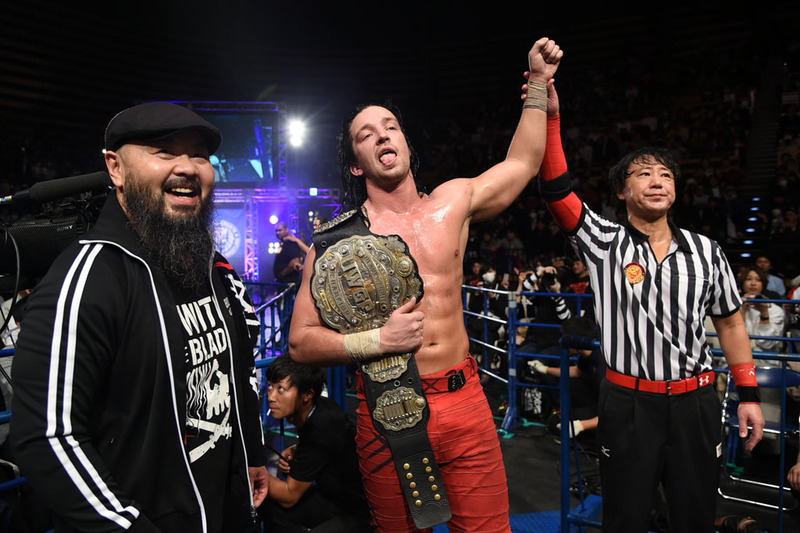 Jay White started wrestling eight years ago with nothing but a dream. “Switchblade” Jay White is the IWGP heavyweight champion and leader of New Japan’s Bullet Club. And he is forever grateful to Fergal Devitt, better known as WWE’s Finn Balor, for finding a home for him in the New Japan dojo after leaving home as a teenager with dreams of becoming a wrestler. A product of New Zealand’s Hibiscus Coast, growing up roughly 45 minutes away from Auckland, White finished high school and then attended basic officer training for the New Zealand Army in 2011. White was proud to serve his country, but formulated a new plan on how to best accomplish that: he would defy the odds and become a pro wrestling superstar. Eight years later, White is now 26 and headlining the upcoming “G1 Supercard” show on April 6 at Madison Square Garden—many miles away, both figuratively and literally, from where he was when he decided to leave home in March of 2012 to pursue life, liberty, and wrestling. White began his career in England, informing his family that he was only on sabbatical to travel, while all along his real plan was to seize hold of his wrestling destiny. As the new face of Bullet Club, White now carries an attitude and an edge (he is, after all, nicknamed “Switchblade”) in his work, which will be on full display as he defends his prestigious IWGP heavyweight title at the historic MSG against Kazuchika Okada. Despite not yet completing a quarter of the 2019 calendar, White has already put together a memorable year. In addition to beating Tanahashi for the title, he began the year as Bullet Club’s newest leader. Bullet Club has been led by a trio of iconic stars, including Balor, AJ Styles, and, most recently, Kenny Omega, but White refuses to spend time comparing his work to theirs. “Each of those guys are different to each other, just as I’m different to all of them,” said White. “I don’t compare myself to them. Each of us has brought something new to the table, but none of them have had the level of success that I have had in the amount of time that it’s taken me. White’s year has also included a victory over New Japan franchise player Okada at Wrestle Kingdom 13 in January at the Tokyo Dome, who he is set to meet again in New York City. There is considerable buzz around the industry that the IWGP heavyweight title could change hands at Madison Square Garden, a happening that would immediately vault to an elite place of wrestling memories at the “World’s Most Famous Arena.” But White is quick to caution those expecting to see the belt around Okada’s waist this April. White has equal amounts of personality and talent, and he looks to show that to the world at MSG. WWE made it official: WrestleMania 35’s main event is the triple threat women’s match between Ronda Rousey, Becky Lynch, and Charlotte Flair. The match added a new layer this past Tuesday on SmackDown Live when Flair defeated Asuka for the SmackDown women’s title. Flair’s inclusion in the match had felt forced and even unnecessary, especially with WWE seemingly shying away from its marquee matchup of a one-on-one encounter between Rousey and Lynch. But the decision to put the SmackDown title on Flair adds additional intrigue to the main event. Both Flair and Rousey, who is the Raw women’s hampion, will walk into WrestleMania as champions. That enhances the story for Lynch, who can now close out the show by defeating Rousey as well as setting up a future title-vs.-title match against Flair. Flair will shine in the match, working in all of her best spots, including the breathtaking moonsault, but Lynch needs to step in for the finish and defeat Rousey. Lynch can then move to Raw and replace Rousey, while Flair can lead the women’s division on SmackDown Live, and this can all ultimately lead to a champion vs. champion match. Jack Swagger’s WWE career peaked at WrestleMania 29. Swagger and Zeb Colter (wrestling great “Dirty” Dutch Mantell) combined to form an extremely entertaining pairing. Swagger took care of the physicality while Colter preached about reclaiming America. The “We The People” story placed a spotlight on anti-immigration beliefs, which is not a storyline that wrestling fans are likely to see again anytime soon in WWE. Swagger, who is Bellator MMA star Jake Hager, joined my WrestleMania Series podcast for our fourth episode. He went into detail about a plethora of subjects, including his arrest for driving under the influence arrest less than two months before WrestleMania. A unique part of Swagger’s match against Alberto Del Rio for the world heavyweight title is that his entrance was not broadcast. “That played into the mistake I had made, and I think they wanted to rib me a little bit,” said Swagger, who drove a military-esque golf cart to the ring at MetLife Stadium. “I think that was the plan all along—to not show the entrance. The episode with Swagger on the WrestleMania Series podcast is now available to download. Kofi Kingston is going to WrestleMania. Sports Illustrated has also learned that one of Kingston’s biggest proponents in WWE is Daniel Bryan, who has pushed to make this match a part of WrestleMania 35. Vince McMahon promised Kingston his WWE championship opportunity at WrestleMania on the condition that New Day’s Big E and Xavier Woods won a tag team gauntlet match. The commercial-laden gauntlet match came to its conclusion when Big E threw the announce table atop of Rowan, allowing New Day to gain a count-out victory over Daniel Bryan and Rowan, ensuring Kingston’s spot at ’Mania. Kingston vs. Bryan for the WWE title was not the original plan for WrestleMania, but it has suddenly transformed into one of WWE’s most entertaining storylines. A title win for Kingston at WrestleMania puts him in an extremely rare position. The overwhelming majority of 12-year WWE veterans do not suddenly catapult themselves into the world title picture, but Kingston is reaching new, untapped levels of popularity, providing a unique blueprint for any pro wrestler looking to succeed at the profession—and that is through an unremitting work ethic and a constant willingness to evolve. Chris Jericho constantly receives credit for his career evolution, and it is all deserved—but Kingston is another star that has continually made himself relevant, despite whatever plans, or lack thereof, the creative team had in store for him. Conrad Thompson returns this Friday to “Something to Wrestle with Bruce Prichard” to discuss WrestleMania 17. The show was headlined by “Stone Cold” Steve Austin and The Rock, and the industry was experiencing a seismic change as WWE had purchased WCW only days before the show. Austin turned heel at WrestleMania 17, siding with longtime foe Vince McMahon for a shocking end to the show. There were also backstage rumors that Hulk Hogan was going to return to WWE for his first ’Mania since WrestleMania IX, which would have added even more intrigue to this star-studded show. Alongside play-by-play man Jim Ross, former ECW owner Paul Heyman does a brilliant job on color commentary on the broadcast. Another highlight was the “Gimmick Battle Royal”, which was broadcast by “Mean” Gene Okerlund and Bobby “The Brain” Heenan. For any pro wrestling fans who are anti-Rousey but pro-women's evolution, I hope they understand that a women's match would never be main-eventing WrestleMania without Ronda Rousey's involvement. And I mean that as no disrespect to Charlotte Flair and Becky Lynch. Kevin Eck, who is a former member of WWE’s creative team, is accurate with his take on the impact of Ronda Rousey in WWE.